10 packs of Native Wildflower Seedbombs. 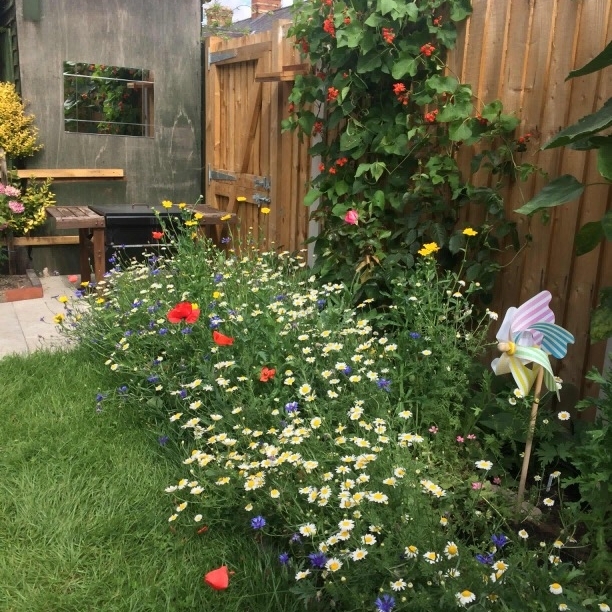 A mix of 18 native wildflower species, enough to create 210 sq ft, / 19.5m² of wildflower meadow. A beautifully packaged combination of our handmade wildflower seedballs, local, Dorset, Beeswax Candles and a quirky bee themed card. The perfect bee lovers gift. Beebombs are handmade wildflower seedballs. We make them from sheltering clay and sifted top soil, packed with 1000s of seeds from native wildflower species. Beebomb sprouting. Make sure they get a lot of water. Ben Davidson; maker, picker, packer and dispatcher of Beebombs. Taken on the farm next to Beebomb lab with my daughter Emily. Ben Davidson was born in Dorset and after many years abroad and in the hustle of London, returned to bring up his daughter where the rolling green hills meet the sandy beaches of Dorset. Learning of the tragic decline of bee and butterfly habitat, across the industrialised world, he wanted to find a way to help restore some of the lost meadows of Britain. Driven by his love for nature and his memories of a childhood spent chasing newts, building camps and generally exploring the ancient heathland of Dorset. Ben both makes and promotes the Beebombs himself. As well as cleaning up afterward. You can contact Ben directly via the contact page.